Admittedly, I was clueless to the art of luxury camping, or “Glamping” as its also eloquently called, when I packed my bags and headed to Kenya for my first African safari. While there are a wide range of camps in Kenya’s world-famous Masai Mara that can accommodate both the frugal and the luxury traveler, many people view a safari as a once in a lifetime trip and often splurge. At first glance the nightly rate of some camps can seem pricey but the upscale accommodations, the food, the guides, the activities and the impeccable hospitality and in-depth knowledge of the culture, the wildlife and the land that a luxury camp can provide is priceless. All of these things can make your trip of lifetime truly unforgettable. 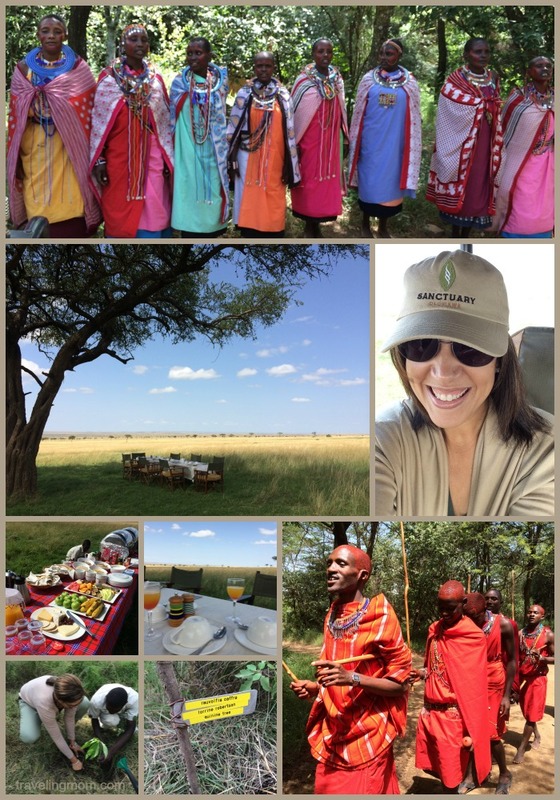 I had the opportunity to visit three different camps in the Mara. 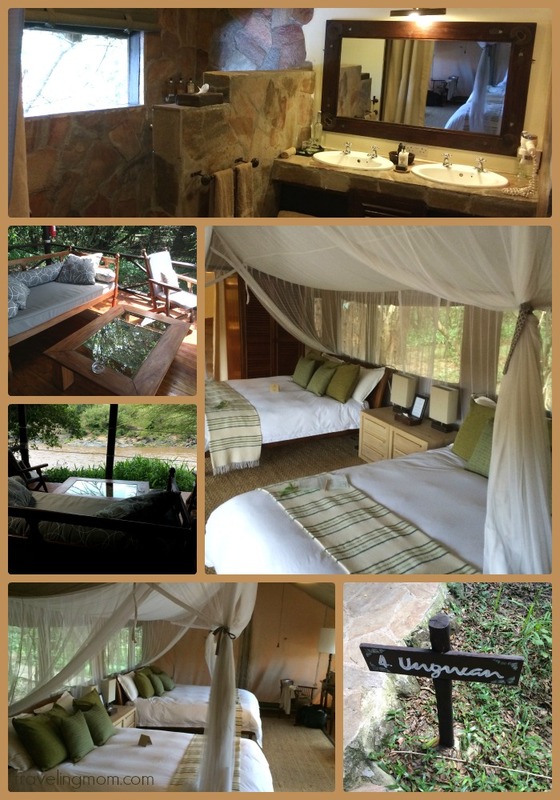 The first was the spectacular Sanctuary Olonana, a boutique luxury camp located on the famous Mara River. And, I don’t use the word “spectacular” lightly. 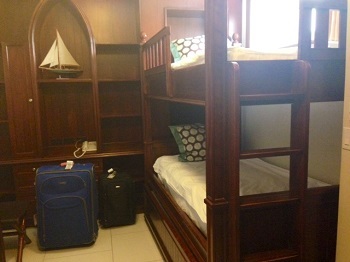 Accommodates families with children of all ages. While I generally recommend saving a safari trip for older kids that will have the patience and the capability to truly appreciate it, if you want to bring the little ones this is the place to do it. 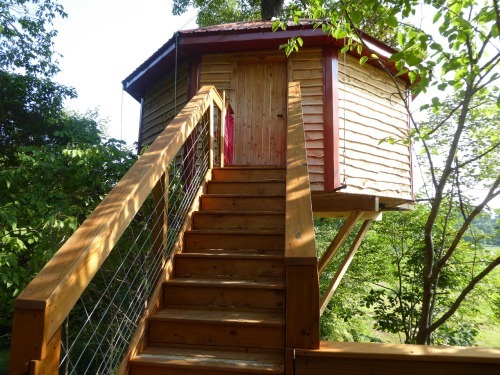 Not all camps accommodate younger children. The camp is fenced in – so no large animals come through the camp. Price: $$$ The accommodations, location, service, and hospitality are well worth the price. Kids under two stay free, 3-11 pay 50% of adult rate, 12+ adult rate. Includes meals, local airstrip transfer, shared game drives, Masai village visit, sundowner cocktails, nature walks, and bush meals. Animal sounds at night. Hippos in the river can be loud and distracting as their active at night. Luggage restrictions, not at the camp, but air travel to the camp is normally 33lbs per person in a soft bag. Sanctuary Olonana is an award-winning, Eco-friendly luxury camp with 14 tents, including two honeymoon suites. The property also boasts a library, swimming pool and a spa. It’s a quick-45 minute plane ride from Nairobi and is nestled along the Mara River with relaxing views; and easy accessibility to a local villages and game drives. Upon arrival at the camp we were greeted by local Masai villagers who welcomed us with traditional songs and dancing. The hospitality and enthusiasm of the Olonana staff definitely adds to this beautiful property. The guides are extremely knowledgeable and personable which made our game drives fun, educational and I always felt completely safe. The tents are beautiful, spacious and relaxing with private river-view terraces. They look like hotel rooms except the walls are canvas with a zipper door. They feature hardwood floors, electric outlets, a nice size bathroom with double sinks, a stone shower and separate toilet area. The beds have draping mosquito nets and there are also screens on the tents that can be covered for weather conditions and privacy. There’s also a curtain to close off the bathroom from the sleeping area and ample closet space. You need a travel adapter to charge any cell phones or tablets. They provide a hair dryer, soap, shampoo and bug spray. I loved the turn-down service that included a hot water bottle tucked in my sheets to warm my bed. Along with traditional safari game drives, Olonana also includes a nature walk, and cultural visits to a Masai village and school. They can also arrange for a hot air balloon safari or a vintage bi-plane excursion for an additional fee. A highlight of my visit was the tree planting my travel party did before leaving the camp. In an effort to combat deforestation guests have the opportunity to plant a dedicated tree tagged with their name in the camp’s indigenous tree nursery. The project started in 2000 and already has planted nearly 5,000 trees. The food was outstanding. They have a natural water treatment system and organic garden so salads and vegetables are not only safe to eat they’re fresh and delicious. Breakfast, lunch (buffet style), afternoon tea and dinner, a three course meal with 2-3 choices, are all scheduled but the camp is extremely accommodating so they will work with requests. They have a kid friendly menu and will also adjust to special eating times for kids. There’s an indoor dining area as well as large deck with gorgeous views of the river. The hippos were easy to spot during my stay and we even had several elephants appear out of the bush and join us (from across the river, of course) for a meal. It was such a treat. You can also arrange to have a private meal on the bush (out on the Mara) or on the private terrace of your tent. 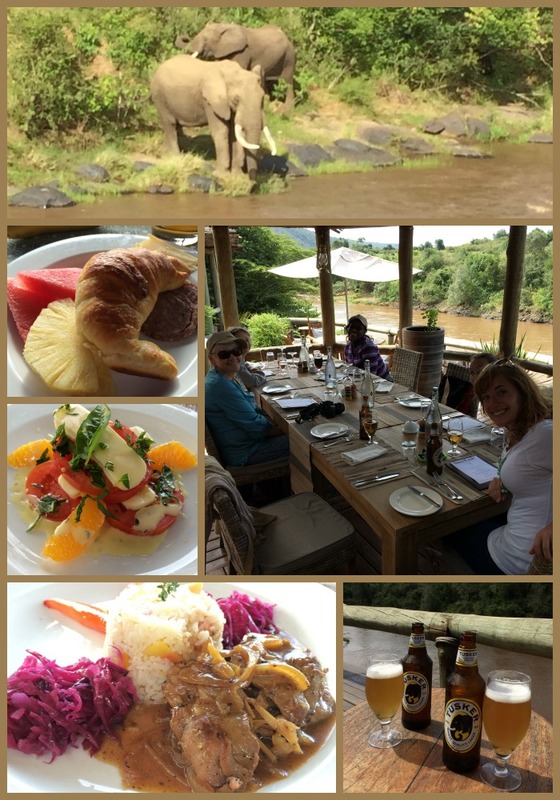 Taking a break from our game drive and enjoying a full breakfast on the Mara – not far from where we spotted two lions lounging – was such an extraordinary experience. 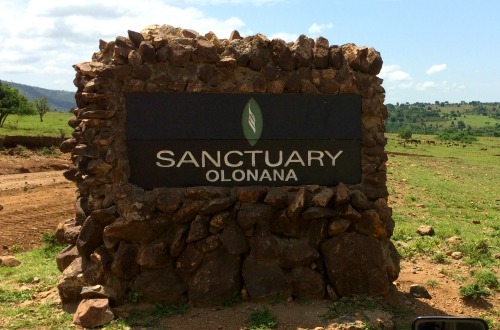 For more information about Sanctuary Olonana, visit www.sanctuaryretreats.com.